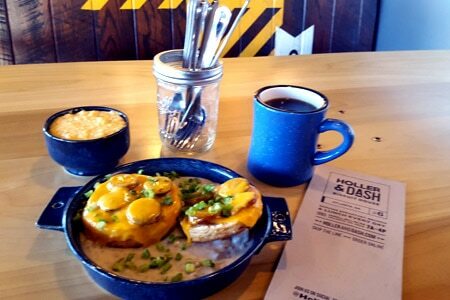 Headquartered in Nashville, Tenn., Holler & Dash specializes in biscuits with a variety of accompaniments. Options include a sausage egg biscuit; a bacon egg cheese biscuit; and an andouille-topped cheese-covered biscuit with a sausage cream gravy Holler & Dash, Westside Ironworks, 1085 Howell Mill Rd. NW, Atlanta, GA 30318, 470-865-5660. Ohio-founded barbecue chain City Barbeque has found its way into the metro Atlanta area with this Decatur location. Line up at the register and place your order for brisket, pulled pork, smoked chicken and tasty sides like baked beans and mac 'n' cheese. City Barbeque, 2511 Blackmon Dr., Decatur, GA 30033, 404-410-2566. Founded in 2011 in Pasadena, Calif., Blaze Pizza has opened a branch in Decatur. It only takes an average of three minutes once your order hits the flame in the ovens before your 11-inch pie can be cut and served (or boxed for take-out). Blaze Pizza, 2131 N. Decatur Rd., Decatur, GA 30030, 678-882-7610.